Nuclear power is the largest source of clean energy in the United States. In 2014, nuclear plants made 19% of all the electricity made in America. That’s 4 times as much clean power as wind and solar combined. America’s nuclear companies pay for 90 cents of every dollar spent by the Nuclear Regulatory Commission (NRC). While cost-sharing keeps federal spending to a minimum, it also encourages the NRC to grow at the industry’s expense. Instead, licensees and applicants should pay the NRC for activities specifically related to their operations, with Congress funding more general programs – such as the development of new regulations for the next generation of nuclear technologies. As was the case for the first generation of nuclear plants, some level of cost sharing for application review should also be provided. Our country’s nuclear permitting process is tailored to a single type of nuclear technology from the Eisenhower-era. 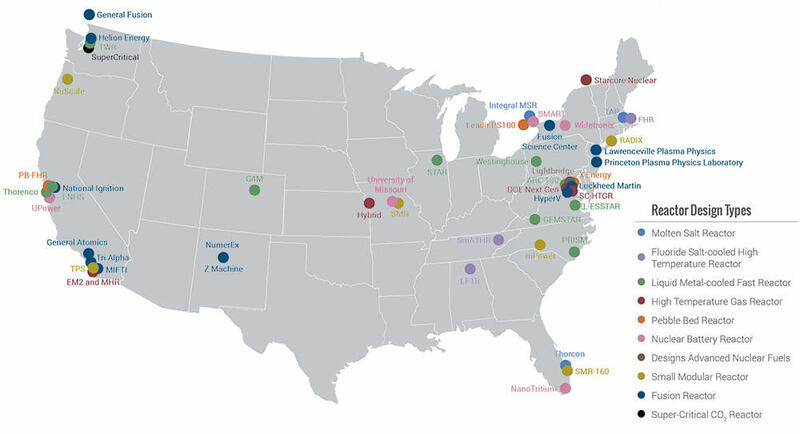 The process, handled by the NRC, must be reformed because new nuclear technologies are coming down the development pipeline from top universities, national laboratories, and companies. Based on the old rules, new designs may be forced to add redundant features and face bureaucratic delays. The current system of licensing is so expensive and outdated that American advanced nuclear companies are looking to deploy their designs abroad. The nation needs to implement technology-neutral licensing processes so our best engineers develop their ideas here at home. The private sector would benefit from greater access to the nuclear innovation facilities at our national laboratories and public research facilities. National laboratories already own expensive (and often underused) equipment that could significantly reduce private-sector development costs. Simply enabling the private sector to access national lab resources would lower costs and stimulate faster deployment times. A new generation of reactors is emerging. American engineers are developing advanced reactor designs that are safer, cheaper and more efficient than the reactors of the 20th century. Some advanced designs are non-light water reactors, known as “fast neutron reactors.” Non-LWRs are potentially more efficient, cheaper, and safer than traditional reactors. Other designs include small modular reactors (SMRs), which can be mass produced, providing cost efficiencies. SMRs can be either light water or non light water. For example, MIT, Berkeley, and the University of Wisconsin are creating a molten-salt reactor.4 The Argonne National Laboratory is exploring sodium-cooled reactors.5 Both of these designs use fuel more efficiently than a light-water reactor, and can potentially run on waste from nuclear weapons or other nuclear plants. Companies like NuScale Power are developing light-water SMRs that can provide reliable electricity to remote towns or military installations.6 Other companies, including GE Hitachi and the Bill Gates-backed TerraPower, are proposing advanced fast neutron designs that have redundant safety features.7,8Many advanced nuclear reactor designs use fuel far more efficiently than traditional reactor designs, resulting in far less waste. In fact, some designs like molten salt reactors can use waste as fuel. Companies, from large multinationals to agile startups, are developing the next generation of nuclear reactors across America. 48 North American companies are working on next generation nuclear, supported by almost $1.3 billion in private capital.10 These entrepreneurs see the demand for clean, reliable electricity as a sizeable market opportunity. Though many new nuclear designs are being developed here at home, companies are increasingly looking abroad to demonstrate their technologies because of expensive and arduous regulations. Our regulatory regime must be reformed to maintain America’s global leadership on nuclear power. The NRC changed its funding structure in 1990 to require 90% cost recovery through fees from nuclear power plant operators.13 This results in exceptionally high fees on new entrants to the industry and severely limits NRC activities to currently operating reactors. 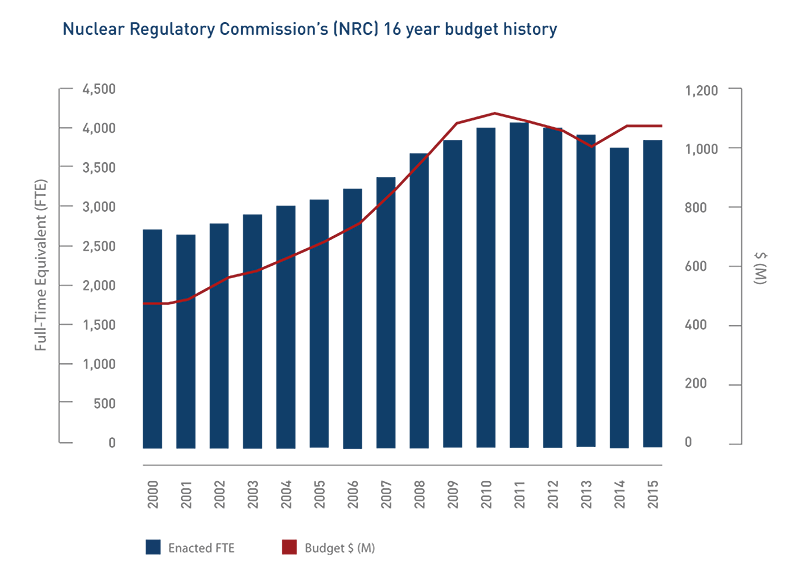 As 90% of funding is recovered from current licensees who are primarily utilities, the NRC has a highly limited budget for developing regulations for still-developing technologies. Without a forward-looking NRC, new technologies cannot be licensed or built in the United States. As a result of the 90% fee recovery obligation, the NRC ultimately ends up charging fees that are much higher than leading engineering firms. The NRC charges a standard $268 per person per hour, which can cost companies as much as $50,000 per meeting.14 These fees are particularly challenging for new advanced reactor licensing companies which have no revenue streams besides investor funding. When LWR technology was first licensed in the 20th century NRC research and licensing was funded by the government, not by the industry. In addition to high fees, the NRC provides no feedback or structure during the licensing process. After applying for a reactor design certification or an operating license, a company must wait an indefinite amount of time (anywhere from 7 to 10 years), with little feedback on the success or failure of their application until either approval or denial. This licensing structure creates a high degree of unnecessary regulatory uncertainty. Venture capitalists have little appetite for hundred million dollar upfront investments that may or may not be approved by the NRC. Not only are licensing fees high and transparency low, the licensing process is biased against non light water reactor designs. Non light water reactors use different fuels, cooling systems, and safety strategies, and require new types of operating strategies. The new reactor licensing process must be adapted to the features and performance characteristics of advanced reactors by adopting risk based technology-neutral licensing standards. The Food and Drug Administration (FDA) is tasked with both promoting safety and supporting industry. As part of that mission, the FDA requires 50% cost recovery from industry, and regulates without stifling innovation and development.15 The FDA also provides specific stages of regulation for drug development ranging from the initial application through commercialization. Drug companies receive feedback at the end of each stage of testing and trials, providing input on the value of continued investment. While not all aspects of the FDA are applicable to the NRC, successful elements like cost-sharing and stages of regulation could be applied to nuclear energy development. The Department of Energy has some of the best technical expertise and facilities for nuclear development in the world-the department was originally founded to develop nuclear science. Yet, much of the department’s resources are of limited use to outside nuclear developers. Publicly funded facilities should be open for public collaboration. The DOE has facilities for advanced computing, neutron flux, fuel fabrication and test reactors, all vital for the development of fast neutron reactors.16 Instead of requiring each advanced nuclear company to “reinvent the wheel”, qualified businesses should be able to engage in greater cooperation with the national labs. The President’s GAIN initiative is a good first step, but does not go far enough.17 The U.S. should begin developing and advanced nuclear test bed where private designs can be tested safely alongside DOE scientists. The Nuclear Regulatory Commission (NRC), in charge of regulating commercial nuclear power plants safely, expanded rapidly in the early 2000’s in anticipation of an expected expansion of the industry. Despite the industry remaining stagnant due to low gas prices, the recession, and new safety requirements, the NRC kept their additional staff. The number of reactors has decreased significantly and the NRC is too large. Because the costs of the NRC are recovered from the industry, a large NRC potentially creates undue burdens through fees and unnecessary rule makings. The NRC and its regulations should be rightsized to fit the current state of the industry. Nuclear power cheaply provides vital around the clock and clean energy, more reliably than coal or renewables. But they’re still shutting down. 5 plants are slated to shut down by 2019, and an additional 8 plants are deemed high risk. One reason why? They’re not paid for all the grid benefits they provide. For example, nuclear power plants can run using on-site fuel 94% of the time – night and day, continuously. No other technology can match that record, which is vital during an emergency or severe weather event. By law, America can only export nuclear technologies to countries with explicit bilateral agreements. Only a quarter of the world’s countries currently have these bilateral agreements, and many are set to expire. The government could facilitate trade by reexamining the top nuclear markets that lack bilateral agreements, such as Mexico and Malaysia. Even in countries with bilateral agreements, the rules often vary on a case by case basis and the process can take several years. This increases the transaction costs for our businesses and may deter other countries from buying American. The government can support industry and American safety by standardizing and reforming the process. Nuclear energy provides nearly 20% of the United States’ electricity, along with over 100,000 jobs.18 Not only is it a major part of our electricity supply, nuclear energy has no air emissions, and is the most reliable source of electricity available. The nuclear industry is one of the best options to lower the risk of carbon pollution and is a major contributor to the economy. Despite nuclear energy’s safety19 and importance for air quality, the American nuclear fleet is at risk. Of the 100 reactors in the United States, 12 are at risk of closing in the next 5 years, while only 4 new reactors are under construction.20 The American nuclear industry is declining due to a number of factors including increasing regulatory burdens and free market distortions. A significantly reduced nuclear industry represents a threat to our national security, our economy, and our environment. All nondefense nuclear energy activities in the United States are overseen by the Nuclear Regulatory Commission (NRC), an independent government agency with the stated mission of protecting public health and safety. The NRC grants licenses for nuclear power plant designs, construction, and operations, and also sets standards for all other non-defense radioactive materials. The NRC’s standards are seen as the safest in the world and are widely adopted by many other nations. In addition to unnecessary rulemaking activities, the NRC’s administrative costs (known as corporate support) are far too high. An Ernst and Young report found that the NRC’s corporate support costs were 37% of the total budget, while its peer agencies had the same services at levels of 20, 25 and 32% of total budget.26The NRC must begin to both eliminate unnecessary regulatory activities and to tamp down on administrative costs. The NRC itself recognizes this and has begun a new initiative called Project AIM27 to voluntarily cut waste. Predictably, it doesn’t go far enough. External oversight from Congress is necessary. Redundant and unnecessary activities of the NRC should be halted, and a new system of risk-informed rulemaking should be put into place to minimize government overreach and waste. About half of nuclear power plants at risk are in deregulated power markets like the Midwest and the Northeast. In a deregulated market, power plants compete to provide the lowest cost electricity — theoretically, a big benefit to consumers. However, the market must be calibrated correctly to compensate the generators fairly. Cheap gas prices and renewable energy tax credits have recently been squeezing the profit margins of safe nuclear plants with many years of life remaining. Two reactors shut down between 2013 and 2014 due to economic pressures, and another 13 nuclear plants are in jeopardy of closing soon.28 Policies intended to reduce carbon emissions like the wind tax credit should not be driving the closure of clean, reliable power sources like nuclear. One other option in some deregulated electricity markets is a capacity market. Unlike the energy market where generators bid to sell actual electrons, capacity markets are created to ensure future electricity reliability. If a generator bids into a capacity market, they are pledging to provide power for a specified period of time (for example, this period is 3 years in the Mid Atlantic PJM market) in the future. Nuclear power is the most reliable source of electricity, able to provide a stable price regardless of the weather or what the gas price happens to be. While some capacity markets have helped keep nuclear plants online, not all markets have full capacity options or operate effectively. Like a smart investor, America would be wise to diversify its resources. As renewables and natural gas expand while nuclear and coal shut down, electricity markets will become increasingly dominated by fewer energy sources. The Federal Energy Regulatory Commission (FERC) should conduct studies to identify the impact of renewable energy subsidies and market reform opportunities. FERC and ISOs should also consider modifying capacity markets to act as reliability markets, which provide support for energy sources offering “firm” electricity: dispatchable, fuel kept onsite, and able to perform ancillary services like voltage control. Tapping this market would benefit the American economy and bolster our influence in nonproliferation talks. If not, we risk ceding America’s leadership role on nuclear technology and safety to more proactive countries. Of the 60-plus reactors in construction around the world, only two are in the United States. China, for example, is building 18 domestic reactors and a handful abroad, in countries such as France and Britain. Russia’s state-owned company is adding 10 more.29 In contrast, America has two.30Around the world, an additional 160 are in the licensing and advanced planning stages. The future for nuclear power is bright. Global energy use is forecasted to rise by one-third by 2040, with most growth occurring outside of the United States33 — and the trend is already materializing. 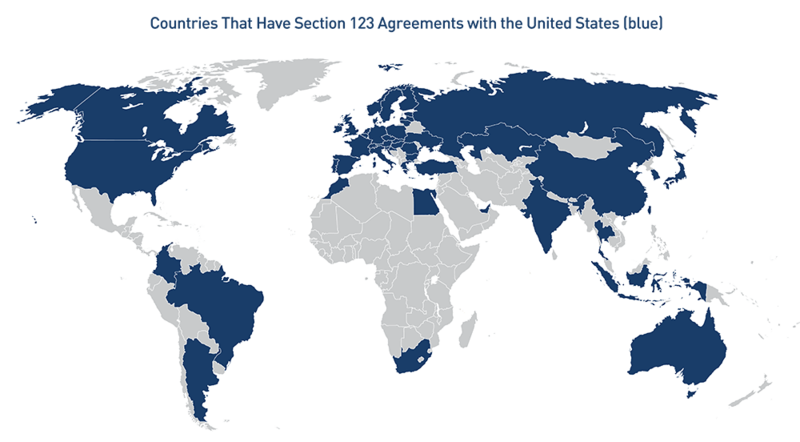 Countries with bilateral nuclear power development (section 123) agreements. As is appropriate, the government has a careful review process for nuclear exports to safeguard sensitive nuclear technologies. This review process largely relies on congressionally-approved bilateral peaceful nuclear cooperation agreements called 123 Agreements. But a recent GAO report found this process is in dire need of reform. Interpretation of the rules may vary on a case by case basis, and key decisions are often delayed. The same report found one process, with a 30-day review target, can take over 1,000 days.35 In the 21st century, these bureaucratic delays cost jobs and American competitiveness. The government should implement new rules that would enable the development and growth of nuclear power developed here in America. Three decades of studies have proven Yucca Mountain is a geologically safe place to store nuclear waste. The Department of Energy should proceed with the certification of Yucca Mountain in order to limit liabilities paid out of the Judgment Fund, as current inaction is directly costing taxpayers hundreds of millions of dollars each year. The DOE should also look to the state of Nevada to discuss paths forward that can benefit citizens with additional investment or employment beyond the construction and operation of the Yucca Mountain facility. Without a long-term solution, nuclear waste is being held in temporary storage at power plants across the country. Even shuttered power plants must maintain security on-site to watch over nuclear waste. Consolidating the waste at interim storage sites would limit taxpayer liabilities and is a logical step toward Yucca Mountain or a more market-based approach. Cost estimates for the current plan for long-term waste disposal are well more than $100 billion. The fuel cycle R&D program at the Department of Energy’s Office of Nuclear Energy should be refocused towards electrochemical recycling and other technologies that can significantly reduce the longevity and cost of both our defense and nondefense nuclear waste problems. Two clear examples are innovative storage techniques and recycling capabilities. Nuclear waste is building up at power plants around the country because of the federal government’s failed promise to take the waste and store it in a permanent storage site. This is bad news for the U.S. taxpayer. They are forced to pay hundreds of millions of dollars each year to maintain nuclear waste at these plants. Not only is the political quagmire costing taxpayers, it’s also been ruled illegal by the courts. Under the Nuclear Waste Act of 1982, the federal government promised nuclear power plants that they would handle the waste. Yucca Mountain was selected after it was determined to be the prime geologic choice of 10 different locations. Dry storage of spent nuclear fuel. A single cask can cost $350,000 dollars. Over 15 billion dollars were spent developing the Yucca Mountain site before pulling the plug. The average nuclear plant makes about as much carbon-free energy as 12 million rooftop solar panels each year and makes the grid more reliable.41,42 Expediting a storage solution would save taxpayers money, give states more confidence in building zero-emission nuclear power plants and boost investor confidence in the next generation of nuclear technologies. Interim, consolidated storage facilities are one promising option. They would jumpstart the process of shipping the waste from our retired power plants to more centralized locations. This strategy already has momentum from the private sector. In May 2016, a Texas project took the first step in getting clearance from the federal government. These types of projects would benefit from policies that clarify the role of interim storage in the nation’s waste disposal policy. Additional energy within the waste can also be tapped by new reactors. About a quarter of the energy can be tapped while cutting the volume by 80%.43 In other countries, such as France, the waste is recycled into fuel nuclear power plants can reuse.44 If the Yucca Mountain experience is any indication, exclusive government management of nuclear recycling would likely face costly, bureaucratic hurdles. Private sector management would enable more elegant, market-driven solutions. New concepts are being developed by companies like Deep Isolation that bury nuclear waste far underground using 3D mapping and horizontal drilling techniques pioneered by the hydraulic fracturing industry. Current plans should be carefully compared to new solutions like Deep Isolation or other waste disposal options that could be much cheaper. Fast spectrum “burner” reactors could also greatly reduce waste volumes and radioactivity by recycling waste from existing reactors, all while producing useful heat and power. From a long-term perspective, waste recycling along with a final repository can greatly reduce the cost of total disposition. The U.S. already has a reactor research program that collaborates with private sector designers and is also designing its own fast reactor that will act as a user facility for testing purposes. The DOE should look for opportunities to recycle waste for use in these and future advanced reactors.